This article was published in the Two Rivers Tribune, a local paper in the general area of Willow Creek and the Hoopah Reservation in Northern California. Bobo and I were hanging out at a local restaurant when a Hoopah reporter started asking questions. I think it was this meeting when we learned that lots of marijuana growers had their rifle sights trained on the helicopters flying overhead that night. I guess the production company should have known better than to use helicopters at night in Humboldt County. 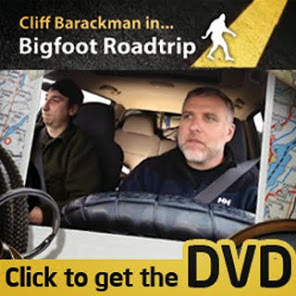 stay in the Klamath Trinity region searching for Bigfoot. Photo by Allie Hostler, Two Rivers Tribune. The helicopters hovering over Bald Hill in Hoopa last week had locals stirring. Rumors flew just as fast as the choppers. First it was a man hunt that was too high profile to be heard on the scanner. Then it was CAMP looking for marijuana grows with infrared technology. Then it was the government investigating a fallen meteorite. Turns out it was the Bigfoot Field Researchers Organization (BFRO) and a film crew from Animal Planet—but we didn’t hear that from them. After searching high and low for the BRFO team last week a surprise encounter occurred at Raging Creek Pub and Eatery in Willow Creek. Over an Ahi Tuna salad and Steelhead Ale, local bigfoot enthusiast BoBo Fay tried not to spill the beans. I saw Matt tweeted on this when it happened. He did say that it was them, but I guess the news didn't pick it up at the time.